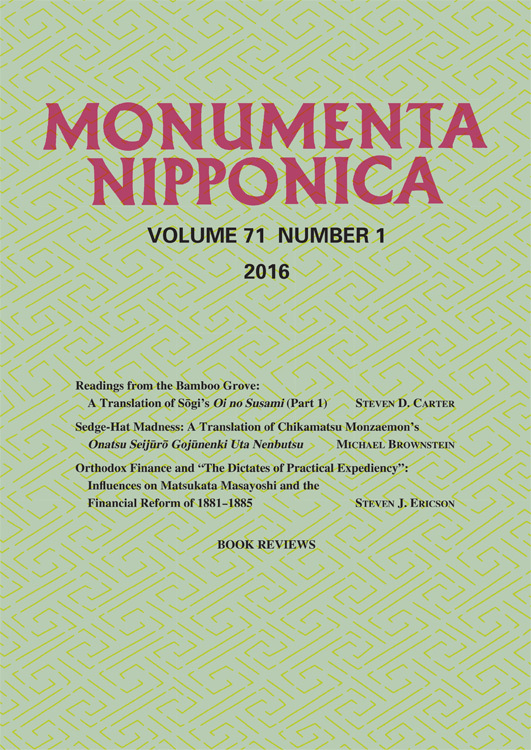 Founded in 1938 and published semiannually by Sophia University, Monumenta Nipponica is one of the oldest English-language academic journals in the field of Asian studies. As a peer-reviewed international forum for researchers across the globe, it carries original scholarly contributions on premodern and modern history, literature, art history, religion, and thought; translations of important Japanese literary and historical sources; and authoritative reviews of recent books on Japan. Print subscriptions to the journal can be ordered from the MN office. From volume 60 (2005), the journal has been available online through Project MUSE. The complete run of back issues is available online through JSTOR. MN is indexed by Arts and Humanities Citation Index, Bibliography of Asian Studies, CNKI Scholar, ERIH PLUS, Historical Abstracts, Index to the Study of Religions Online, International Bibliography of the Social Sciences, MLA International Bibliography, and Scopus. Supported financially by Sophia University, MN also receives generous assistance from the Japan Foundation. Monumenta Nipponica is an affiliated research organization at Sophia University and is headed by Shimazono Susumu.